Epitaxial ferroelectric Hf0.5Zr0.5O2 films have been successfully integrated in a capacitor heterostructure on Si(001). The orthorhombic Hf0.5Zr0.5O2 phase,  out-of-plane oriented, is stabilized in the films. 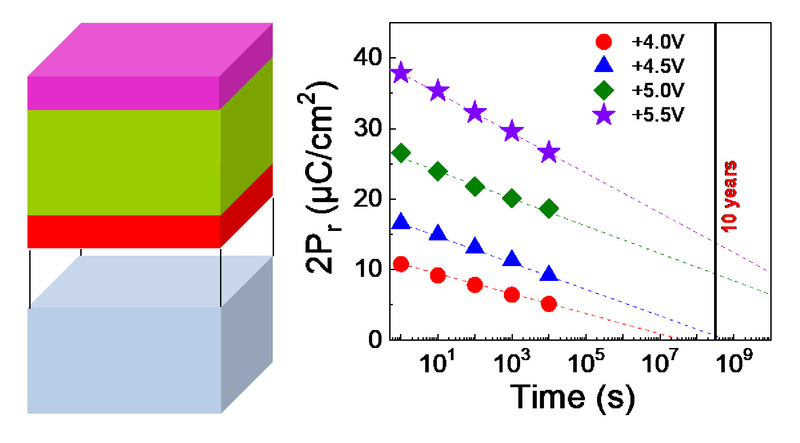 The films present high remnant polarization Pr close to 20 μC/cm2, rivaling with equivalent epitaxial films on single crystalline oxide substrates. Retention time is longer than 10 years for writing field of around 5 MV/cm, and the capacitors show endurance up to 109 cycles for writing voltage of around 4 MV/cm. It is found that the formation of the orthorhombic ferroelectric phase depends critically on the bottom electrode, being achieved on La0.67Sr0.33MnO3 but not on LaNiO3. The demonstration of excellent ferroelectric properties in epitaxial films of Hf0.5Zr0.5O2 on Si(001) is relevant towards fabrication of devices that require homogeneity in the nanometer scale, as well as for better understanding of the intrinsic properties of this promising ferroelectric oxide.